This Homemade Ranch Dip is loaded with magnesium and probiotics as well as other important nutrients. Since magnesium deficiencies are rampant in the U.S. it is helpful to have a tasty way to get your magnesium! Plus, there is no guilt when dipping your veggie (or even your cracker) into this delicious dip. I have written the recipe using dried herbs assuming that unless it is summer you probably won’t have all of them on hand. If you do happen to have them fresh, just use about half of the amount. Fresh herbs have more magnesium and other vitamins and minerals than dried, of course. Before I get to the recipe, let me break down the nutritional highlights of this homemade ranch for you. Homemade Mayo: Homemade mayo made with pastured egg yolks and avocado oil is abundant in healthy fats. If you choose to make a lacto-fermented option, this will up the probiotic content of your dip. If making homemade mayo isn’t for you, try this mayo from Primal Kitchen. It is full of healthy fats from cold-pressed avocado oil instead of the omega 6 laden rancid vegetable oils that are in most store-bought mayo. Grass-fed kefir (or homemade yogurt or cultured sour cream): Kefir, homemade yogurt, and cultured sour cream are all good sources of healthy fats, calcium as well as magnesium. However, kefir contains far more probiotics than yogurt which contains more than cultured sour cream. 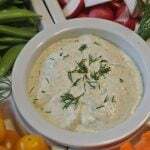 Here is a post from Oh Lardy if you want to learn how to make your own cultured sour cream. Apple Cider Vinegar: You have probably seen many a post about the wonders of raw apple cider vinegar. It is helpful in balancing blood sugar and managing weight among many other uses. It contains probiotics and beneficial acids. Make sure you buy raw apple cider vinegar with the “mother”. Parsley: A good source of magnesium as well as other vitamins and minerals. Chives: A good source of magnesium as well as other vitamins and minerals. Dill: A good source of magnesium as well as other vitamins and minerals. Basil: A good source of magnesium as well as other vitamins and minerals. Garlic Powder: While there is minimal magnesium in garlic powder, it is anti-viral, anti-bacterial, and anti-fungal. Onion Powder: Onions follow in garlic’s footsteps. They have minimal magnesium, but are anti-viral, anti-bacterial, and anti-fungal. Sea Salt: Celtic and Himalayan are good sources of magnesium as well as other important minerals. 1 cup grass-fed kefir (strained). If you don’t have kefir, use grass-fed plain whole milk yogurt (homemade or quality store-bought). You could use grass-fed cultured sour cream as well. Mix all ingredients. Allow to meld together for at least a few hours before serving. I like to serve this ranch dip with veggies for dipping or use it as a salad dressing. A nutrient-dense, delicious version of ranch dip that is loaded with magnesium and probiotics. 1 cup grass-fed kefir (strained). If you don't have kefir, use grass-fed plain whole milk yogurt (homemade or quality store-bought). You could use grass-fed cultured sour cream as well. Mix all ingredients together. Let flavors meld for at least a few hours before serving. Next Post Do You Have a Magnesium Deficiency? This is so informative, I was looking for healthy dips and had no idea basil was so nutritious. Definitely trying this out and looks like it would be perfect for entertaining too. Ranch is my favorite dressing and one of the only foods I haven’t been able to find a good homemade substitute for. I’m definitely going to try this recipe. Thank you!